The test is the latest launch by Pyongyang this year as the isolated regime steps up efforts to develop an intercontinental ballistic missile that can deliver a nuclear warhead to the continental United States. Seoul: North Korea test-fired a missile Monday into Japan's maritime economic zone -- the latest in a series of provocative launches that have ratcheted up tensions over its nuclear weapons ambitions. It was the North's third ballistic missile test in as many weeks and the 12th this year -- carried out in defiance of UN sanctions warnings and US threats of possible military action. US military monitors said the short-range missile flew for six minutes, while Japan said it fell into the country's exclusive economic zone (EEZ) -- waters extending 200 nautical miles from its coast. The launch comes in fresh defiance of tough talk from US President Donald Trump, who promised last week at the G7 summit that the "big problem" of North Korea "will be solved". Japan's Prime Minister Shinzo Abe swiftly condemned the test and vowed concerted action along with its US ally. "We will never tolerate North Korea's continued provocations that ignore repeated warnings by the international community," Mr Abe told reporters. "As agreed during the G7 summit, the North Korean problem is the international community's top priority. In order to deter North Korea, we will take concrete action with the United States." The North has been stepping up efforts towards its ultimate goal -- developing an intercontinental ballistic missile that can deliver a nuclear warhead to the continental US. The isolated but nuclear-armed North has test-fired a missile almost every week for the past three weeks. The latest, a short-range Scud, flew about 450 kilometres (280 miles) before landing in the Sea of Japan (East Sea) between the Korean peninsula and Japan, the US Pacific Command said. 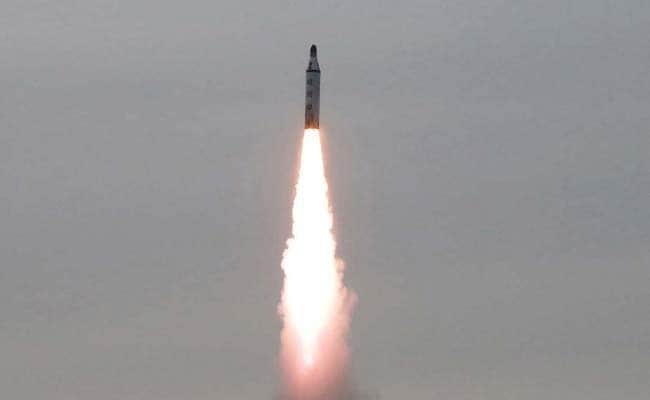 Monday's test also marked the second time this year that a North Korean missile fell provocatively close to its neighbour Japan. Despite US President Trump's strident warnings, Secretary of Defense James Mattis said in an interview that aired Sunday before the launch that a war with North Korea would be "catastrophic." "The North Korean regime has hundreds of artillery cannons and rocket launchers within range of one of the most densely populated cities on Earth, which is the capital of South Korea," he told CBS News. "This regime is a threat to the region, to Japan, to South Korea. And in the event of war, they would bring danger to China and to Russia as well. But the bottom line is, it would be a catastrophic war if this turns into a combat, if we're not able to resolve this situation through diplomatic means." Mr Mattis declined to say what kind of action from Pyongyang would constitute a "red line" for Washington, saying the administration needs "political manoeuvre room." South Korea's new president, Moon Jae-In, ordered a meeting of the national security council to assess the launch, which came a day after North Korea said its leader Kim Jong-Un had overseen a test of a new anti-aircraft weapons system. The South condemned the test as a "grave threat" and a challenge to the new leader who advocates dialogue with the North in a break from his conservative predecessors. "That the North repeated such provocations after the inauguration of our new leadership... is a direct challenge to our demand for peace and denuclearisation of the Korean peninsula," the foreign ministry said. But China, the North's main trade partner and ally, has made it clear that the push for diplomatic talks -- and not imposing more sanctions -- is the priority. The US has said it is willing to enter into talks with North Korea -- but only if it halts its missile and nuclear tests.